Summer is here and homegrown cucumbers are ripening on the vine. Let’s make REAL pickles! What is a “real” pickle? It’s where you use natural fermentation (and NO vinegar) to change a cucumber into a crisp, sour treat. They are delicious and nutritious! My chief fermentation instructor inside my Living Homegrown Institute, Karen Diggs, is here to show us how. 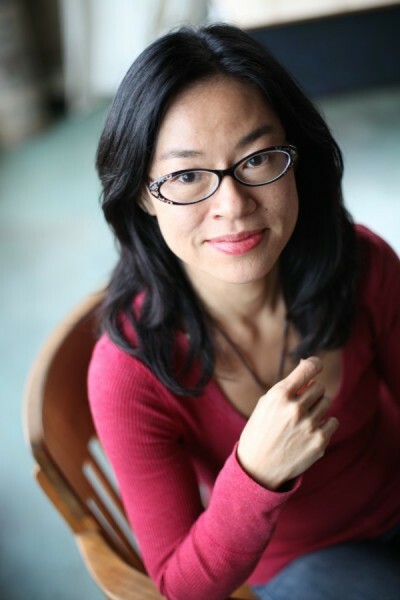 Karen is a certified nutritionist, chef, and food writer. She teaches nutrition and culinary classes at Bauman College in Berkley, CA and is also the founder of Kraut Source. The Kraut Source is a cool fermentation device that sits on an ordinary mason jar and lets you ferment in small batches. 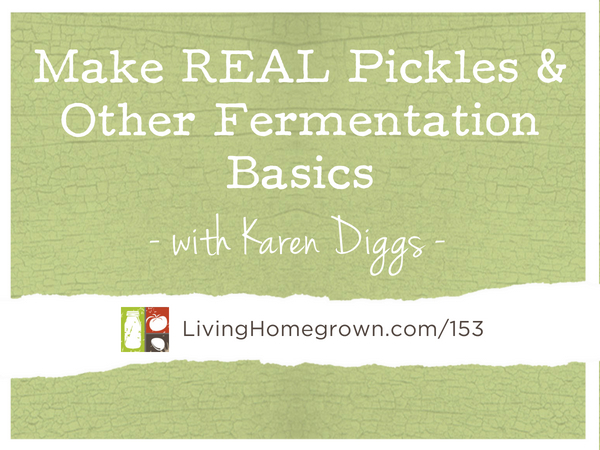 Download Karen’s recipe for real pickles and ferment like a pro. I know you’ll love it. Kraut Source * – Tool to make fermentation easy! I really enjoyed this episode and the clear instructions on how to make real pickles. I have a question about washing the vegetables or fruit. Will rinsing them first also rinse off the bacteria that enable fermentation? Than you! Great question Sharon. The answer is that a general rise will not take away all of the bacteria. You only need a tiny, tiny bit of bacteria to get the fermentation process going. When you rinse, you are NOT scrubbing the veggie in hot soapy water. You are only rinsing and rubbing the veggie with your hands. It would be impossible to take away every speck of bacteria. So you really are not removing all the beneficial bacteria when you rinse. Another great episode! I’ve made the lemon dill sauerkraut that Kristen Shockey spoke about on your podcast (episode 109) and a “fiery ferment” is next on my list to try. But right now this episode with Karen Diggs came at a perfect time. I have a quart jar filled with my garden cucumbers just starting to ferment on my counter. I loved Karen’s use of tea leaves so I used an organic green tea in mine. Thank you for sharing! Next on my list is what to do with the glut of cherry tomatoes that will be coming in very soon! Fantastic Marcie – So glad you are enjoying the episodes! I loved this episode. One question. Let’s say I had an abundance of cucumbers and fermented a dozen jars with that pickle recipe…. but I don’t have the fridge space for all the jars. Could I can those jars for room temperature storage? If so, would that compromise the taste or the beneficial probiotics and digestive enzymes? Thanks! Yes, you can “can” the pickles. But it WILL affect the texture and the canning process will kill all of the beneficial probiotics. Sorry about that.